This article continues on from Part 2 - Basics and First Run. Now that I'd got to the point of being able to build and run something I needed to setup a build/run environment to make debugging as painless as possible. There's going to be alot of build/run/debug cycles before this thing is finished so anything that streamlines that process can only help. For this type of work, I find Sublime Text works really well - it's without doubt my favourite text editor and well worth the very reasonable purchase price (particularly when you consider it runs on Windows, Linux and OSX). Anyway, Sublime has the ability to invoke build tools including make files. It's very basic and simply invokes the same commands as those used in the previous part to build the .TAP file. By putting this in the project folder I can now simply hit Ctrl+B to get a new build. (be sure to turn on Tools -> Save all on build). Now all I need to do for the build/run/debug cycle is hit Ctrl+Shift+B, then type "load" in the emulator and I'll land on my breakpoint. Nice! the explosion animation at the start seemed to run for too long with one "particle" arriving very late and running at a weird angle across the screen. the very top left character - the corner of the bordering box - went missing a few seconds after the complete title screen appeared. I noticed while running under the debugger with tracing enabled (ie: slowly) some extra block characters appearing at the very left of the scrolling message at the bottom. Although these are appear as minor artifacts they're indicative of deeper problems so I try to sort out little issues like this as soon as I notice them. The first thing I tried was to relocate the data area back to its original position to see if that resolved the issue (ie: changed data: equ 0x3700 to 0x7300). And yes this stray particle disappeared. I then tried some other addresses and the problem didn't recur. Finally setting back to 0x3700 and the problem recurred. Double checking my maths revealed the problem - I was overlapping the last few bytes of the program. Changed it to 0x3800 - problem fixed. This one was little harder to find. In this case I knew I was looking for an errant write to memory address 0xF000 (ie: the first character in video RAM). To track this down I used ubee512's debugger and tracing capabilities. First I configured the Console window to show as many lines of history as possible (9999) and then restarted the program and let it run at full speed up until about 1 second before the problem occurred. I then hit EMUKEY+\ to turn on tracing which slows things down and then as soon as the character disappeared I hit EMUKEY+BS to stop the program and looked at the trace. Just a few lines down I spotted a missed reference to video ram. Searching for regex "3C..h" found two others as well. Problem fixed. 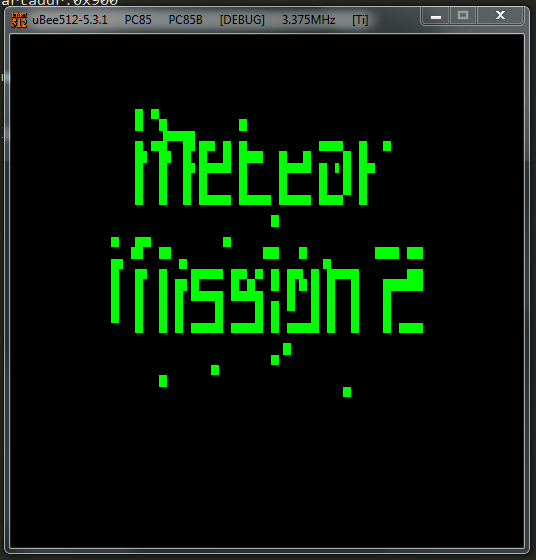 So now the title screen works... if you've seen Meteor Mission before these screens will look familiar. Note that although all the animations were running (the explosion, the scrolling text at the bottom) the speed was wrong. 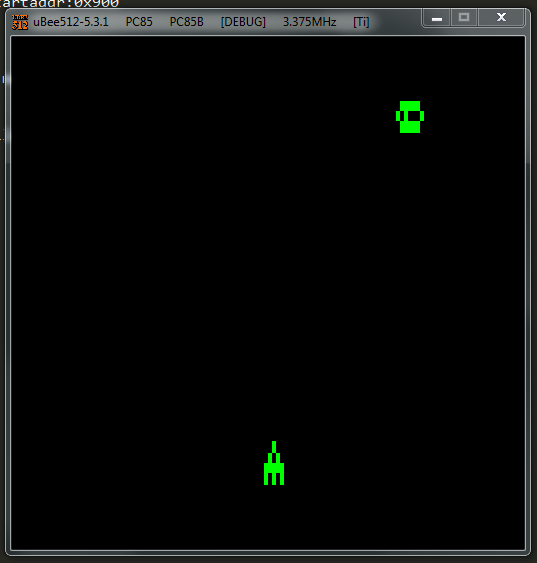 The TRS80 runs at 2Mhz whereas the Microbee runs at 3.375Mhz. Next up though is to look into keyboard handling. 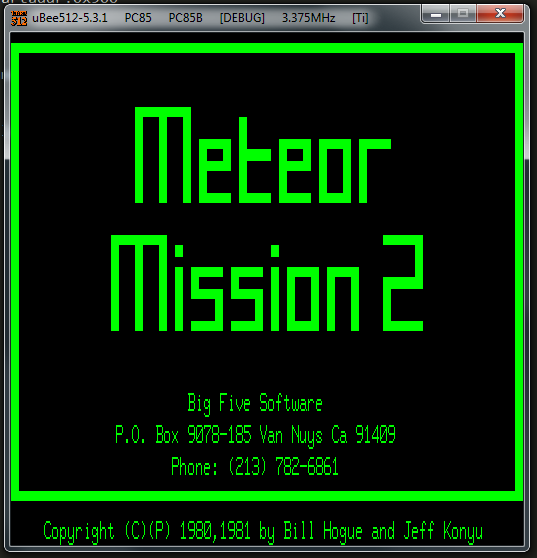 Porting Meteor Mission II to Microbee continues with Part 4 - Keyboard and Flashing Text. A simple but powerful set of C++ template classes designed to be easy to use, easy to read, cross platform compatible, efficient and totally free. Topten Software is the developer of Cantabile - the highly regarded music software designed specifically for musicians who perform live. More information and a free trial is available from the Cantabile website - http://cantabilesoftware.com.